DETROIT – Uganda treats LGBT people like second class citizens. But how deep is the systemic violence in Ugandan society? How cruel is its media in the portrayal of sexual minorities? How little does the government care to protect its LGBT citizens? And why should people in America care what happens half way around the world? On Feb. 20 at 6:30 p.m. a unique opportunity comes to Detroit, where people can learn about the plight of their LGBT brothers and sisters in Uganda. Freedom House will host a free screening of the movie “Call Me Kuchu” followed by a discussion panel that includes Frank Mugisha, executive director of Sexual Minorities Uganda. The event takes place at the Charles H. Wright Museum of African American History. There will also be a special VIP Reception from 5-6 p.m. for $25 that benefits Freedom House. Rogers reached out to Mugisha after seeing so many Ugandan refugees seeking asylum because of their sexual orientation or gender identity. “As a case manager, I have had an intimate view into their lives and history of trauma, both mental and physical. While heartbreaking, yes, it has also pushed me to do more in recognition of their bravery, their sacrifice. So, I wanted to do something to send a message of support to our current and future LGBT residents. By inviting an internationally recognized LGBT rights activist to Detroit, to Freedom House, we lift them up. Frank’s visit acknowledges their struggle, their courage, thereby validating them. It serves as a statement that we will no longer stand for the violation of one’s rights,” said Rogers. In Uganda sexual minorities are called “Kuchu.” The documentary “Call Me Kuchu” focuses on the plight of LGBT people there. Filmmakers Katherine Fairfax Wright and Malika Zouhali-Worrall explored the lives of LGBT Ugandans in the midst of society’s mistreatment. Among them was activist David Kato, dubbed the first gay man in Uganda. Kato was raised in Uganda, but spent some time in South Africa in the late 90s. There he met other gay men and was determined to bring freedom and acceptance to his homeland. In 2004 he helped fund SMUG and served as an Advocacy Officer for the organization. While the women were filming, Kato became involved in a lawsuit. A local publication, known for its anti-gay rhetoric, printed the photos and addresses of 100 LGBT citizens along with a call to “hang them.” Kato sued the publication and won but within a month of the ruling he was murdered in his own home, bludgeoned to death with a hammer. The film shares Kato’s story along with several others. “It is time the space be created for dialogue and conversation to be had because the plight of LGBT people around the globe can no longer be ignored. The struggle is an international one, and progress can only be achieved when we build coalitions and work together. Solidarity is borderless, and as human beings we all have a responsibility to ensure one another’s inherent human rights and human dignity is not put down or deprived, ” said Rogers about the upcoming event. The panel discussion hopes to bring to light several perspectives in the battle for equality in Uganda. Panelist Allida Black is an activist with a lengthy list of involvement, including managing director of the Allenswood Group, a collaborative founded to empower individuals and strengthen democracy through education, and a senior fellow at the Women’s Research and Education Institute, and a research professor of History at George Washington University. She also is a co-founder and chair of Ready for Hillary. Panelist Kelly AuBuchon is a Senior Attorney for Freedom House. Her prior experience includes work with Naturalization Outreach in Pontiac; the Michigan Department of Civil Rights in Detroit; the Family Law Assistance Project in Auburn Hills; and the Refugee Development Center in Lansing. She is a member of the State Bar of Michigan and the American Immigration Lawyers Association. Panelist Husam Abdulkhaleq earned a Bachelor degree in Sociology from BirZiet University at Ramallah, West Bank in 1986, and a Masters degree in Mental Health Counseling from the University of Tennessee in 1998. He began work at ACCESS Psychosocial Rehabilitation Center for Victims of Torture and Refugees in 2001 as a psychotherapist where he still works today. To date he has assisted more than 1,500 refugees and survivors of torture. He has provided court testimony for more than 100 asylum seekers and over 300 psychological affidavits for asylum interviews. Panelist Jamiil M. Gaston, development coordinator for KICK – The Agency for LGBT African-Americans, attended Lawrence Technological University for a Bachelor of Science in Construction Management. While at Lawrence Tech, he worked in the Office of Student Engagement where his passion for helping others was born. Within the Office of Student Engagement, he oversaw student organizations, assisted with event planning, and managed the LGBT Resource Center and its ally training program, Project Safe. He is also a graduate of The LEAD Academy, a social justice and equity training course designed by KICK. Panelist Donald Bierer is an attorney and longtime member of Amnesty International. He is a founding member of Amnesty International USA’s LGBT Human Rights Coordination Group, where he leads AIUSA’s LGBT human rights work on Sub-Saharan Africa. Last spring Bierer organized visits from Alice Nkom, a prominent Cameroonian lawyer to the late Jean-Claude Roger Mbede, and Bishop Christopher Senyanjo, Ugandan clergy and LGBT rights activist, to Amnesty’s national conference in Washington, DC. Outside of Amnesty Bierer is a recently admitted attorney and recent graduate of Indiana University Maurer School of Law in Bloomington. While a law student, Bierer co-founded the LGBT Law Project, a pro bono service organization serving LGBT organizations and individuals at Indiana University. Its first major report, More Than Just a Couple: 614 Reasons Why Marriage Equality Matters in Indiana received national media coverage. Bierer and his husband Le, live in Lansing. 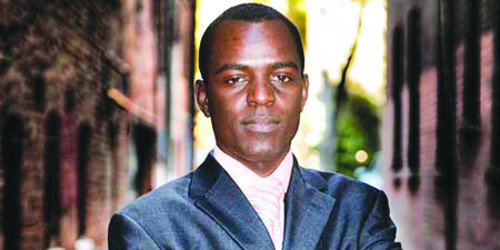 To learn more about the event, go to http://www.freedomhousedetroit.org/index.php/news/upcoming-events/frank-mugisha/.